forget super mario, this is super obama world! I'm not sure if we've ever had a president inspire a video game where he isn't the object of ridicule, but this might be the first. Super Obama World is a lot of fun! Watch out for the pigs and the bailout barons! MIX member Edward pointed it out on the forums. And if you use Firefox, you might want to try out the Flash Game Maximizer plug-in that Mike Ambs pointed out to us. Super Obama in fullscreen! flash game challenge: dolphin olympics 2! 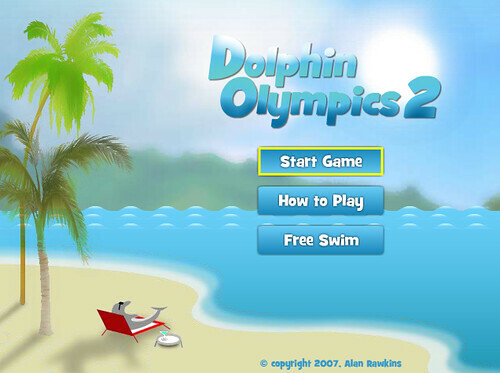 This week our flash game challenge is Dolphin Olympics 2! Yes, Dolphins are supposed to be cute and calming forces of nature, but this game will have you spinning in your seat trying to jump through rings, tail-sliding and going for jump combos -- all in under two minutes. This week's Flash Game Challenge is a seemingly cute car romp by Ferry Halim. But don't let its cute looks fool you -- Sunny Day Sky is fun, addictive, and perfect for the challenge because it's all about getting crazy high scores. It's also super easy to play. Just click your mouse once to open your umbrella and click again to close it. Try to jump over as many cars as you can to achieve higher point multipliers. As always, post a screenshot of your high score and we'll give you a shout-out next week PLUS the prime real estate on MIX. Have fun! This week's flash game was sent in by Schlomo Rabinowitz. Dino Run is pretty much a mad dash to stay ahead of Armageddon. Gameplay is simple: collect eggs, don't get trapped, and just keep running! Post your high score as a screenshot on MIX and you'll get a shout-out on next week's show and the prime real estate. Good luck!